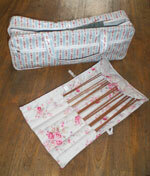 My dearest friend bought me these gorgeous bamboo needles and case by Cath Kidston for Christmas. I’ve been promising myself for years that I’d start a new collection of needles – I’ve always used my Mum’s old-fashioned metal ones (plus a few fancy plastic ones she must have splashed out on somewhere along the line) so it was a joy to find how beautiful and smooth these ones are. They’re textured enough that the stitches don’t slip off unnecessarily, but smooth enough to let them slide when needs be. Feel good on your fingers too. Then to top it all she’s bought me a knitting bag for my birthday – did I mention she’s my dearest friend?! I tried hard not to like Cath Kidston for a long time – her stuff’s everywhere and the designs seemed too obvious – but she’s really got a great eye for vintage designs and it’s hitting the mark at the moment, so I’m drawn into her Brighton shop whenever I’m there. There’s an interesting range of 40s inspired clothes at the moment and I’m never one to turn away from a retro vintage (inspired) dress or two. The website’s rather lovely too.